Here are some of my thoughts while attending a dinner with guest of honor Mr. Hiromitsu Hayashida, former Toyota Manager and trainer. Another highlight and something unique to the Shingo Prize International Conference is the ability to attend a “Fireside Chat” (for a fee) with practitioners of the Toyota Production System. I had the honor to spend an evening with Hiromitsu Hayashida. Through a translator, Tyler, we had a wonderful evening of questions and answers, storytelling and insights from someone who had lived TPS and had an effect on future Toyota leaders. Here are a few quick stories that I thought I would share. Mr. Hayashida talked about work at the Toyota-GM joint venture at the NUMMI plant in California. He said it took over a year to get the American workers comfortable to pull the andon cord when there was a problem or issue. The principles of “Quality at the Source” and “No defects Passed Forward” are still difficult for many organizations to embrace. I remember years ago telling a production manager “We don’t need 800 parts per hour, we need 800 GOOD parts per hour.” We need to continue to instill the notion that it is okay to stop a process to make it better (instead of continuing with a bad process). When I asked Mr. Hayashida what would be his advice if we wanted to train managers that haven’t spent a lot of time coaching to be coaches (Toyota starts the coaching training before they become managers), he said “That is a tough question.” He paused and thought about it and stated that there needs to be a specific training plan for these managers. As more organizations pursue operational excellence they will have to find a way to have management become more of coaches and mentors. This may be difficult for people that have already been in management rolls without the specific coaching/mentoring, people development. Mr. Hayashida thought that the toughest job at the first Lexus plant was the assembly operator. They had to walk along the moving conveyor with the car while doing their task in less than the takt time. Nobody wanted to do this tough job. Mr. Hayashida and his team focused on this to improve things for the operator. Someone on the team spoke up and said “Why don’t we put the operator on the conveyor so they can move along with the car?” What a breakthrough; this is a very common method of car assembly today, but the original idea had to come from somewhere. 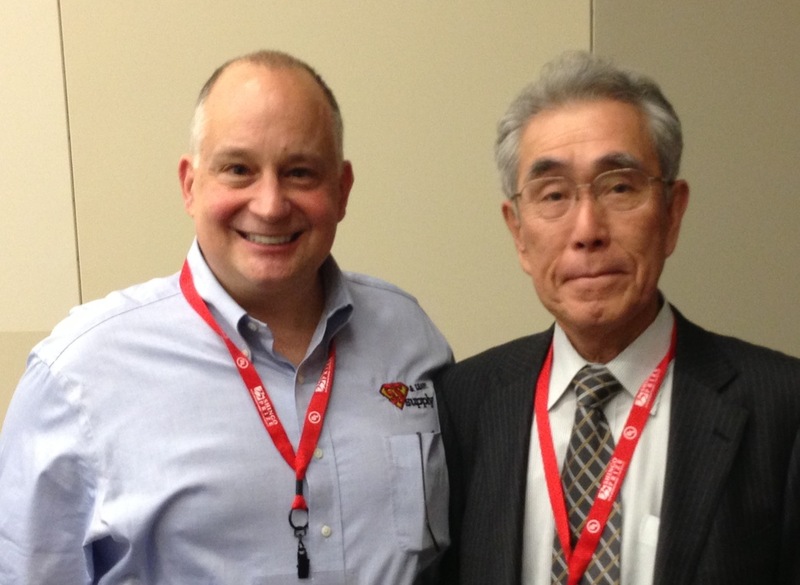 I appreciate the time Mr. Hayashida spent with us and the wisdom and insights that he shared.